With the Philadelphia Phillies deep in the throes of the offseason and lacking the dexterity required to play golf, the Phillie Phanatic took care of some business at the ESPN offices in Bristol, Connecticut. In an "It's Always Sunny in Philadelphia"-styled vignette posted Monday, the mascot is forced to wait for his meeting a little bit too long. The Phanatic decided to use his time wisely and sought to exact revenge for all the tired Philly fan tropes used by the national media whenever something goes wrong at a sporting event in the U.S.
During the rampage, the Phanatic draws an "X" on a photo of talking head Skip Bayless and swings a sledgehammer at some desks. Once he is called into his meeting, the Phanatic calmly walks into the room with two copies of "Pheel the Love! 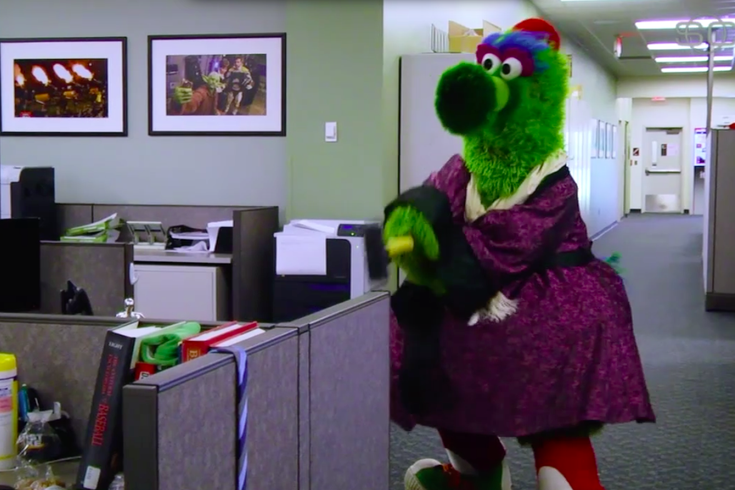 : How the Most Powerful Force in the Universe Builds Great Companies - Phillie Phanatic Style!" that was written by Phanatic performer Tom Burgoyne.